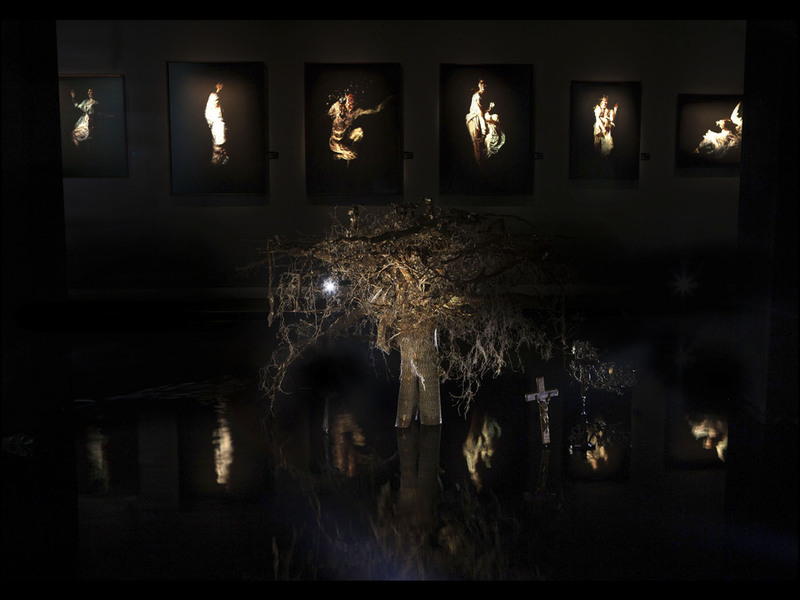 Alexander James: interview Alexander James: Rastvorennaya Pechal (Dissolved Ennui) Triumph Gallery, Moscow 18 April – 11 May 2014 by ANNA McNAY Alexander James (b1967) is a photographer with a difference. Rather than capturing the moment spontaneously, James creates intricate sculptural compositions submerged in huge tanks of purified water as the object for his camera. The effect of light passing through, heightened against a darkened background, gives the resulting images a painterly appearance, recalling Dutch vanitas still lifes. This blurring of boundaries between photography, painting and sculpture renders James’s works uncategorisable as well as eerily beautiful. Six months ago, James, who is usually based in London, moved his entire studio to Moscow to prepare for his current exhibition at the Triumph Gallery. Arriving not speaking a word of the language, he made his home and studio in a 250 sq metre space in Red October, an island in the centre of the city that, under tsars and later Soviet authorities, housed a chocolate factory, but is now a hub for contemporary art. 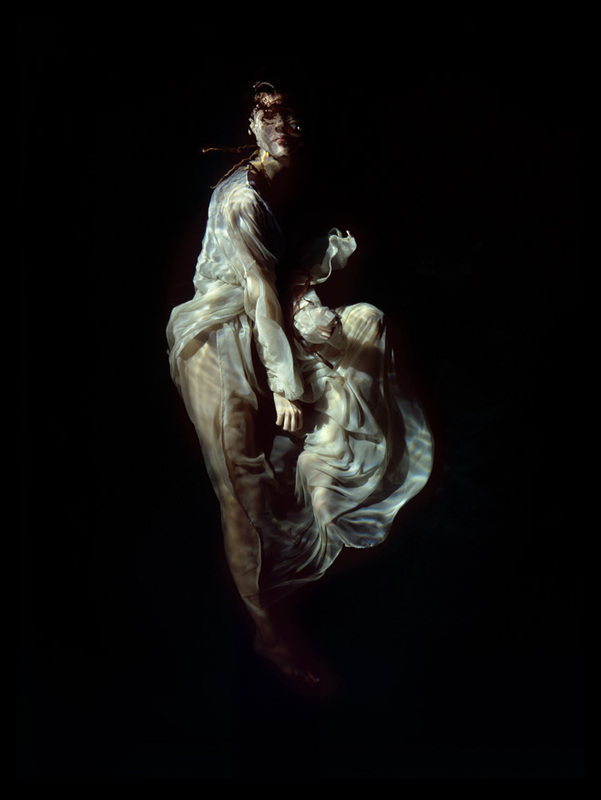 Working with live models suspended in water, the new works he created in situ develop many of his earlier themes, which were greatly inspired by John Millais’ Pre-Raphaelite masterpiece Ophelia (1851) and Paul Delaroche’s La Jeune Martyre (1855). James found time to speak to Studio International about the process of relocation and creation, just after the opening of his exhibition, Rastvorennaya Pechal (Dissolved Ennui). Anna McNay: What made you decide to move your studio to Moscow? Alexander James: Driving seven tonnes of studio rig out here was all part of my initial reason to come to Russia; a western artist’s dialogue using his own studio to create an in situ dialogue with Russia and, of course, the Russian people – this had not been done by a British artist for more than 30 years. 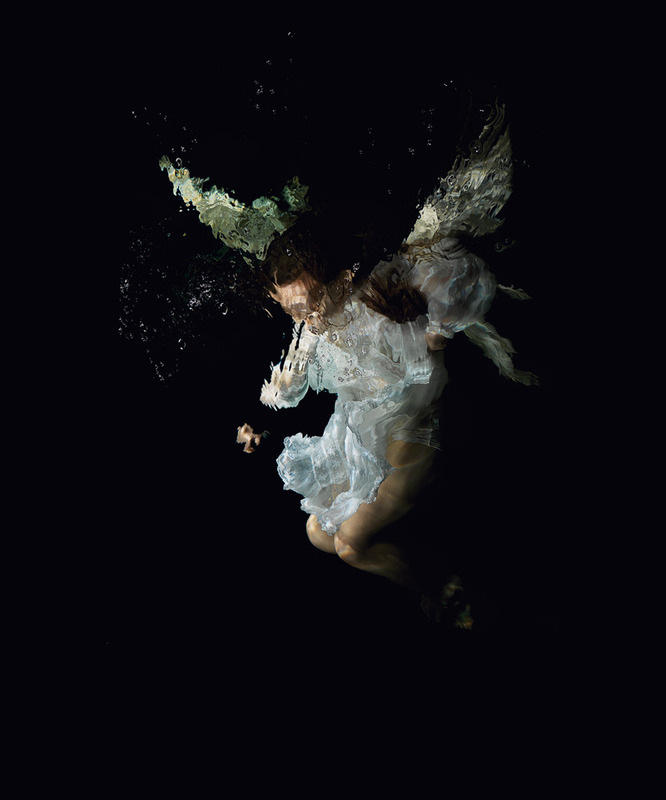 AMc: Had you already got a project in mind – namely that you wanted to develop the themes you had explored in your earlier body of work, A Beautiful Announcement of Death, inspired by Millais’ Ophelia and Delaroche’s La Jeune Martyre, working with live models suspended in water – or did you select and cultivate that specifically for the location? AJ: Yes, I did reference earlier works that were completed in 2012, but the preparations for this particular show date back 10 years in my mind, and there are some early sketches and physical preparations from nearly two years ago. These included preparatory trips to research and find spaces, galleries, etc. AMc: How do you feel that being in Russia has influenced the project and the works? AJ: Every facet of these works is infused with Russia, through the use of local yarns and fabrics (hand-sewn into garments by myself and my Russian team), to the props and models. Even the water had its own special flavour optically. It was very important to me that the pieces should create a dialogue from something that all Russians are knowledgable about: art history, myths and legends. AMc: When you arrived in Moscow, were things already set up for you, or did you have to organise workspace and accommodation for yourself? Your studio is in a disused chocolate factory on an island in central Moscow, called Red October. Was this your own choice? How has it been living and working there? AJ: The only thing organised was the gallery I would show the works in. Triumph Gallery is highly respected. It has previously held only two other major British artists’ solo exhibitions on this scale: Damien Hirst and the Chapman Brothers. The studio space was a monumental task for me to begin preparing singlehandedly for the first six weeks through Christmas and the New Year. It necessitated manual labour on an unimaginable scale; it was quite daunting. I dug out 17 cubic metres of human-waste-soaked soil, cut out more than 200in of ¼in steel plate pipework and disused machinery, and removed three truckloads of building material rubbish that had accumulated over 50 years of disuse. It has been an important space in Russian culture for the past 130 years; “Red October” became a symbol for Russian people through the times of the tsars and the Soviet era. My choice to base myself here was absolutely the right one. AMc: How was your transition, adjusting from living and working in London to living and working in Moscow? AJ: Living through winter in an underground studio without any facilities was certainly trying. Russian winters are everything you imagine: I had icicles hanging from the walls. The change for me was profound but I have done it this way many times before, and not for a single moment did I not enjoy the process and every facet of the experience; this was my decision, now get on and do it. As an artist, I believe it is important to be known for carrying out my word. There was a time when people did great things, but now it seems that all anyone does is talk about great things. This is not for me. After all, I have only three things of value to offer: my hand, my word and my work. I consider all three to be deeply embedded in my practice. AMc: How is your Russian – then and now? AJ: Then – zero. Now – I am a little embarrassed about my dialogue still, but I can understand quite well. I often have extended periods where I don’t leave the studio. For an earlier body of work, Swarm, this lasted for six months, during which time even my food was delivered. Once I start the process, I have no way of switching it off until it is completed, no matter what. For Moscow, this meant that I didn’t get out of the studio to practise my Russian all that much. My staff speak either English, French or Japanese – so my other language skills have really benefited. I just had no time or opportunity to learn more. I am working on it right now though as I intend to come back for another project. AMc: How did the idea of working with objects suspended in water come about? AJ: This process has been developing for more than 30 years. I cannot begin to explain my fascination with the painterly effect water has on sculptural works documented on film. AMc: You are displaying one of the tanks in your exhibition in Moscow. It is the first time you have done this. What made you decide to do it? AJ: Russia is a new audience for my work, so it was important to show a complex piece such as the Veiled Crucifixion vitrine case. It weighs exactly one tonne and is all handmade from stainless steel, with a hand-sculpted skull and crown of thorns beneath a fabric woven from silk thread from silk moths I breed in the London studio. Every facet of my process, no matter what is needed, is created by hand in the studio. AMc: How did you find models who were willing to be suspended underwater? How long did they have to remain suspended underwater for? AJ: Each piece is carefully planned from initial drawings and illustrations – both on paper and digitally – with reference shots placed over the top of sketches for digital distribution to the team. Props and garments are handmade to be absolutely authentic, which is a great deal of work. But many pieces fall at the last hurdle; they simply miss and fall away in the hang. With any artwork, it either hits or it misses. AMc: Are you working with analogue or digital? AJ: I only use digital as Polaroids. All final works are exposed on film. All film up to 10 x 8 sheets is processed by hand in the studio – as it should be. These transparencies are then taken to the darkroom for printing. The only editing I do on my work is deciding “yes” or “no”. AMc: Did your assistants travel with you from London? AJ: For this project, I employed a completely local crew. AJ: That is a very long and often funny conversation to be had over a decent bottle of red. AMc: You have referenced Dutch artists of the 17th century as influential, and claimed to live according to their principals. In what way? AJ: If you were an early Flemish vanitas painter and you wanted to paint a scene involving a fish, for example, you saved up no matter what and went to the market every day until you found exactly the right fish; took it back to the studio; painted it; then invited all your friends round to eat it in celebration. This obsessive dedication of everything you have to the creation of that piece clouding your mind, this was a recurring theme during this period. My life is very simple really; I have no interest in ever owning a Ferrari. All my time, money and spirit is dedicated to the studio. AMc: What is the significance of vanitas to your work? AJ: My work is a direct reflection of my life. Loss is a terrible thing unless you know how to celebrate it. All negative things for me must be converted into a positive act of creation, perhaps to preserve or immortalise that loss. I find it comforting and uplifting to then remember that person. I want to placate the sadness that can overwhelm us and keep discussions on death firmly planted in the light where everyone can see, because when it gets dark for me, it gets pitch black. AMc: The exhibition’s title is Rastvorennaya Pechal (Dissolved Ennui). What is the significance of this? AJ: The correct translation is actually “Dissolved Sadness” but modern Russian places it at “Dissolved Ennui” – both are wonderful to me. My studio, which was formed 24 years ago, is titled “Distil Ennui, to extract the essence and beauty of life to appease world weariness”. Having this show titled around my studio and core practice in this beautifully poetic Old Russian dialect was an easy choice for me. With this creative process, indeed my sadness ebbs away. But I still have trouble pronouncing it correctly which makes me laugh and Russians look rightly confused. AMc: Your work blurs boundaries between sculpture, photography and painting. What is your own training? AJ: Thirty years of training and still learning this complex dialogue. AMc: Will you be glad when you can come back home again? AJ: I have very strong and mixed feelings about leaving. Within western media, there is so much absurd propaganda about Russia. I am not a political artist, but I fiercely defend ignorant opinions with my limited ability. AMc: What will be the one main thing you are taking away with you from your time in Russia? AMc: And what one thing do you hope to leave behind as your legacy? AJ: Memory. Memory of why I came here, what I created here. And the wonderful friendships I have made. That is legacy enough for me. AMc: What are you planning to do after this project? You’ve worked abroad a few times before, so do you have any future destinations in mind?